South Carolina. Earthquake. Yes, according to the US Geological Survey, you need to link these two together in your mind. The government has issued a warning to folks in that southeast American state that it’s time to anchor the foundation. Last week, the government geophysicists issued an update (for the first time in 6 years), warning about the shaking bits in America. South Carolina ranked among the top. They, of course, are not offering any time or date or exact location for the impending earthquake. 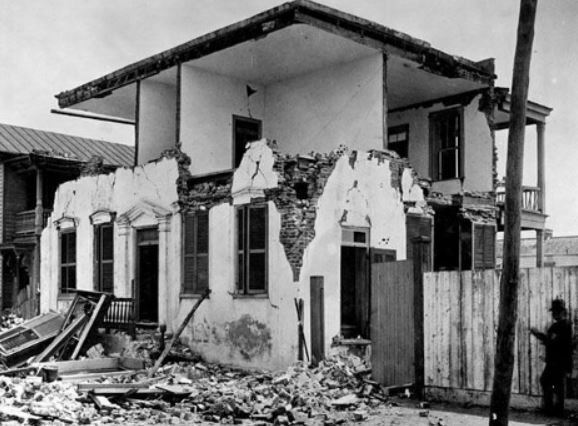 But if there is a devastating Charleston earthquake, it won’t be the first one. A Charleston home, the day after the quake. History agrees with the USGS warning. In the summer of 1886, a one-minute earthquake destroyed 2,000 buildings (including the brick house shown to the left) – and killed about 100 people. There had been a paucity of seismic activity in the city before the earthquake. And nothing much since. So it was a rather unpleasant surprise. Devastating, but rare, seismic events are hard to explain. Along active faults (San Andreas, for example) we know why the ground moves. But in the Charleston case, this is an intraplate region. The 1886 earthquake is accordingly referred to as an intraplate quake. To quote one researcher, “The cause of this sort of earthquake is the subject of much on-going research.” Which means we can’t explain it. Because of its unusual and unexpected occurrence, people at the time assumed the destruction was the act of an angry God. A Canadian, Ezekiel Wiggins (known as the Ottawa Prophet), was told by an angel that a second, much more devastating, earthquake would strike the eastern seaboard one month later, on September 29. His prophecy created widespread panic. Believers quit their jobs and donned fashionable “ascension robes” in preparation for the Second Coming. Most were back at work the following Monday. This entry was posted in History, Religion and tagged earthquakes, South Carolina, USGS. Bookmark the permalink.